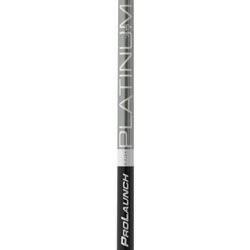 This ProLaunch Platinum Grafalloy shaft is made of a combination of graphite and a Smart-Ply fiber. This Smart-Ply fiber technology is comprised of "six unique cross-linked fiber axes." The six fibers take advantage of thin layers of unidirectional, high-modulus, carbon fiber material. These fibers are oriented along six different axes designed to maintain the integrity of the shaft during the golf swing. What does this mean? When you swing the big dog, you want as little deformation in the club shaft as possible. The more the shaft bows and deforms, the more energy is lost. The Smart-Ply stabilizes the shaft, keeping it from deforming and bending, thus saving this energy to be transferred into your golf ball. Finally, this shaft features the Micro-Mesh technology. This technology is designed specifically to stabilize the clubhead and reduces torque at impact. In addition, this gives you a better feel, even on mishits, and lessens distance-stealing spin -- giving you a more optimal ball flight. I recommend this shaft for those golfers looking for a high launch angle. The ball flight you can expect will be an initial high launch that flattens and carries. Those of you looking for a more medium ball flight: take a look at the Grafalloy ProLaunch Blue.